Nicola Barker really doesn't have to work too hard to impress me, my love of Darkmans through last year's Bookerthon faithfully recorded here for posterity and, on the strength of that, I'm not sure why I didn't immediately pick up and read everything Nicola Barker has ever written. Perhaps it's that fear, the next book you read won't be so good, will taint what's gone before? Happens often enough, though equally I've often read my introduction to an author's oeuvre, been swept away on the crest of their wave and the quality of that has been sufficient to sustain my faith in their writing through their lesser moments. But what am I rabbiting on about, nothing like this has happened with Nicola Barker, au contraire, Clear might just be as good as Darkmans and one thing's for sure, once I'm into the uniquely effervescent narrative style my only disappointment is at a mere 300 pages when I want at least 800 now. Clear is one of those books that recounts one of those gimmicky publicity-drawing stunts,events that you remember vaguely and didn't take too much notice of at the time but now wish you'd followed some of the analysis and commentary that it spawned. 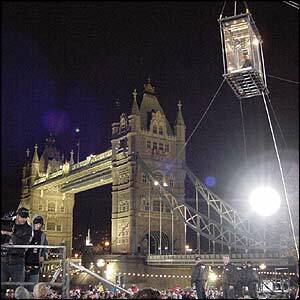 The event is David Blaine's forty-four days in a perspex box dangling aloft near Tower Bridge in London in September 2003. For the record and because I have the record, at the time I was reading The Secret Life of Bees by Sue Monk Kidd, Brick Lane by Monica Ali, The Talented Mr Ripley by Patricia Highsmith and Four Dreamers and Emily by Stevie Davies and everything else I could find by Stevie because I'd just discovered her. But I wasn't paying a good deal of attention to David Blaine. Thankfully Nicola Barker was and the evidence is Clear ...sorry, that was a chance to good to pass up. As the blurb and this picture from the BBC reveals, the facts are most certainly clear, David Blaine got in the box and came out forty-four days later a convenient four stone lighter, the question is why? Twenty-eight year old Adair MacKenny would dearly like to know why too and explores all the avenues with mixed results. 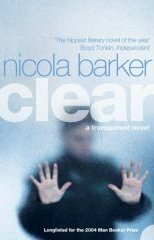 Often hilarious, often poignant Nicola Barker has nailed realistic dialogue which I think Kirsty over at Other Stories and I have agreed is both internal and external, in spectacular fashion. This is the sort of dialogue that read aloud, resounds with the honesty of real chatter and the brackets contain all those thoughts, the bits you'd like to say but don't and they work. Adair's life working in a mundane London office job, clad in the latest, or not so latest designer gear is often a life of manic spontaneous madness and the social scene down at Blaine's box is delineated with that clear crystal eye that I now associate with Nicola Barker after Darkmans. The analysis of the way Brits take to a peep show like this, and handle spectacle whilst maintaining British reserve, is done to a turn. We'll either go to just see what's going on, but really we'd prefer not to be associated with it, but we'll go just in case we might miss something or we go and embrace the whole thing, take a guitar and a primus, camp out, have a party and wave a flag or in David Blaine's case it would seem fling an egg. Failing all that we have the journalists to deride it all. Meanwhile Nicola Barker, through her usual array of fabulous characters, is also digging away quietly at all those unseen and unwritten social prejudices, then add in her take on consumer items like the gerbera as the 'Number One flower of insider choice', and the priceless moments just start to stack up. Yes the gerbera is, and no I hadn't noticed, and how exactly do they get that bit of wire through the stem to stop them going floppy? Easy to pre-judge Adair but he subjects the whole spectacle to some surprisingly careful analysis which in the end made everything clear to me too. Images of transparency and entrapment abound alongside allegories of starvation of every sort in a world of plenty, pseudo-death and real death, and Adair sees right through it all to the nearest approximation of the truth he's likely to find and certainly helped me to do likewise. 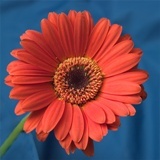 Goodness am I delighted to have read this one, one of those refreshingly different and unusual palate-cleansing reads and grateful thanks to dark peak images for permission to use this nice gerbera picture because actually I didn't have a gerbera to hand today.